He made it clear that 25th January – eve of Australia Day – would be Sydney's chance to consider a world before that Fleet arrived in Port Jackson rather than get too negative about the unreversable fact that it actually happened. A day spent at the First Nations Playwrights' conference; early evening at the UTS Big Talk on how to prepare for the Captain Cook 250th next year; 'Spinifex Gum', a politically motivated concert at night in the Opera House; than an all-night Vigil under the still unspoiled stars at Barangaroo. I began with the Big Talk where historian John Maynard was kind to Cook up to the point where the gallant Captain recognised that the Aborigines he encountered had made it clear that they really only wanted him gone; hence, perhaps, saving his claim to 'posses' New Wales (he forgot the South in his journal) was done very quietly on the remote Possession Island, virtually in the Torres Strait. Wesley Enoch himself dropped a few hints about how he and the Biennale of Sydney's Indigenous Director, Brook Andrew hoped to emphasise the symbolic side of Cook's effect on Australia via the view from the shore, looking out at those “massive canoes” and bringing the Captain's Pacific adventures ashore with the construction of a Melanesian village of that era in Sydney. All surely better, observed Enoch, than a historically inaccurate circumnavigation of Oz in a model of the ship that never attempted that. On to the Opera House via central Sydney's nightmare of road changes. At least the lines are straight in the Pilbara – transporting countless tons of its red iron ore from its hollowed out heart to the sea and then to China. Fine film-work established the spinifex-dotted landscape and the interminable length of those trains to set up the possibility of an unlosable clash between Lang Hancock's lusty admission of his belief in the “greed of Capitalism” and the folks on the ground whose ancestors were massacred, whose sacred sites and water sources have been wiped away by the miners, whose remote community homes were dismissed as “lifestyle choices”, whose fate in prison may be a cruel death, and whose way of life has been mentally broken by the unwelcome changes wrought by intruders. Sadly, without surtitles, much of this went missing. But a delightful evening was nevertheless had, largely through the multi-faceted talents of Marliya – the 18 strong group of young women who've graduated from Lyn Williams's Gondwana Voices. And it was that invented bundle of springs who came up with the idea for this concert series, as much as anything because her Cairns-based Indigenous choristers were graduating from Gondwana training and a future needed to be found for them. Quite why she attached her Eastern Australian kids to a totally Western Australian series of issues and the Yindjibarndji language, I'm not quite sure. But the baton was picked up and run by the Melbourne-based Cat Empire – composer Felix Riebl and muso Ollie McGill. They made many trips to the West, loved the sounds they found there and the natural rhythms of the Yindjibarndji language, but have not made any attempt to link into its music. This is a Western concert with influences ranging from plainsong to the Blues, via Jamaica! And the girls relish it all, each with her own mic, throwing in some perfectly mastered group choreography and radiant smiles. 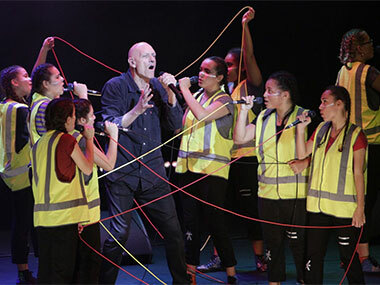 Superstar guests Emma Donovan, Peter Garrett and Briggs have bought into the project and each contributes powerfully – though I had no idea that Garrett was singing and jerking as a FIFO worker tackling an evil spirit on behalf of the fearful locals, nor that his song referred to the dreadful Flying Foam Massacre off the still-contentious Burrup Peninsular. 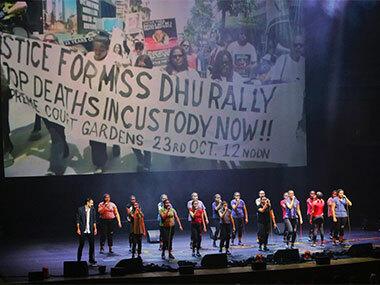 Later the politics behind the choir's impassioned 'Don't Shut Them Down' was only clarified by racing pace aerial images of remote Aboriginal communities which the former Liberal government regarded as a total waste of money. This could have all been so much more effective. For, at the Big Talk, Indigenous film-maker Rachel Perkins had stress the importance of preparing the country for acceptance of the ALP's proposed referendum on the Indigenous Voice to Parliament. “Out of our losses can come change”, she insisted. 'Spinifex Gum' could have gone so much further in supporting this really necessary process.